They are the steadfast companions who help our protagonists; the icons who help define a series and offer a memorable figure when people try to recall a name. 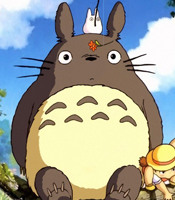 Mascots come in varied shapes, sizes, and species, and are often as prominent as the person they are attached to. Some, like Pikachu from Pokemon, even gain more fame than their partner. Regardless of who or what they are, mascots linger in our memory. Let's go through a few who help make their anime what it is! 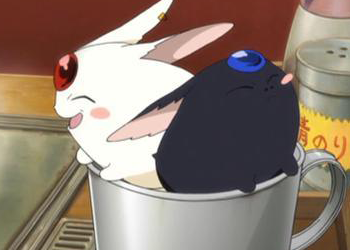 This pair of cute, chubby, bun-shaped creatures features in several of CLAMP's works. Notably, the shared universe of Tsubasa Reservoice Chronicles and xxxHolic. In Tsubasa Reservoir Chronicles' timeline, they used to reside with the witch, Yuuko (xxxHolic), until she sent one to accompany Syaoran, Sakura, Fai, and Kurogane (TRC) on their journey to reclaim Sakura's lost memories. 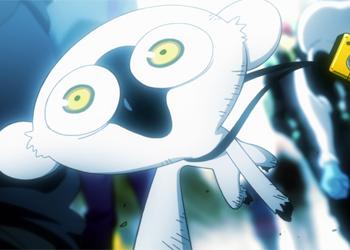 The other remained with Yuuko and her assistant, Watanuki. Their abilities seem to be related to dimensions. 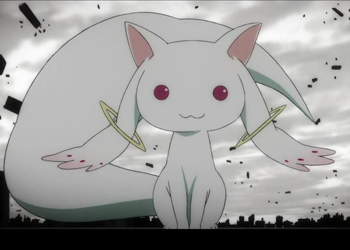 Despite existing in different worlds, the two Mokona can communicate and send information or objects to and from the other as needed. Both are extremely cheerful creatures who talk about themselves in the third person and try to make themselves helpful wherever possible. If they are ever a mild nuisance to their caretakers, it's because sometimes they're too happy. 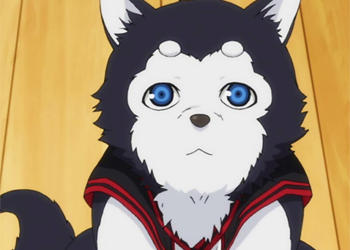 The bossy, demanding companion to Sakura: Kerberos (or 'Kero') is her guide, companion, and friend in her quest to retrieve the scattered Clow Cards. He is the guardian of the Clow Book from which the Cards originated and had been sleeping within it until Sakura inadvertently opened the book. Despite his shortcomings, he is a staunch protector of Sakura. In his true form, he's a giant cat that boasts control over fire- and earth-based elements and the relevant half of the Clow card deck. His native powers include the ability to sense the presence of the lost cards, the ability to summon protective barriers, and the ability to shoot fireballs from his mouth. His plush lion cub form is able to all of these to a lesser degree. And, of course, he can fly with his cute little wings. Kuro is Rin Okumura's cait sith familiar. He was once a god, but fell to the level of a demon when humans came to try and demolish his abandoned, forgotten shrine. 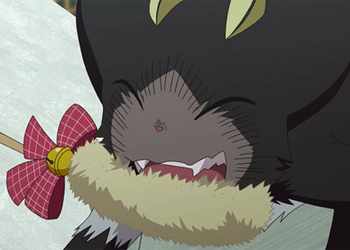 Kuro was initially familiar to Rin's father, Father Fujimoto, but ownership transferred to Rin after the man passed away. Despite being over a century old, Kuro can exhibit childish behaviours as well as feline ones. 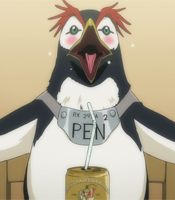 He and Rin share a close relationship and are rarely seen far apart from one another. Kuro's does not have explicit abilities, but he is able to transform between his usual house cat size to a more monstrous nekomata - about the size of a truck! 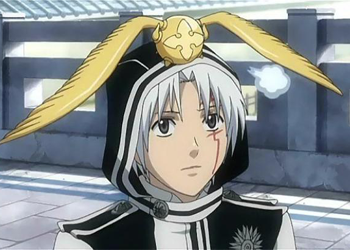 Because he is an extremely high-level demon, he also possesses resistance to most of the Exorcists' anti-demon weapons, such as silver and holy water. His face when he's eating is too cute to resist! Sonic the Sonic Monkey (not to be confused with the famous blue hedgehog!) is companion to one Leonardo Watch. He makes his debut by stealing Leo's camera and inadvertently helps Leo cross paths with an operative of the hidden organisation, Libra. 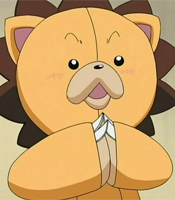 After fulfilling his major role in the anime's first episode, he opts to remain by Leo's side as a faithful, sometimes comical, companion. As suggestive of his name, Sonic's main trait is his ability to move at sonic speeds - hence his name and why his breed are known as 'sonic monkeys'. Beyond that, Sonic does not seem to have any other special traits. Human eyes are unable to track a monkey moving at sonic speed, but Leo, with his God Eyes, is able to keep track of him easily. 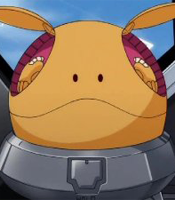 This round, winged, Harry Potter Snitch-like being is Allen's golem. He is a simple, curious creature who is steadfastly loyal to his master - perhaps to a fault. When not engaging in a childish rivalry with Kanda's golem, Timcanpy is usually off sating his vast curiosity about something. Sometimes he'll learn new human habits from it, but other times it may lead him into trouble. As a golem, Timcanpy is capable of the basic functions of communication, the recording and replaying of both video and audio, and is able to track his owner. He possesses the obvious power of flight, but he is also capable of changing physical aspects (such as his size) on a whim. Although he doesn't have a face, Timcanpy's actions sure make him cute! Named after Tetsuya Kuroko for his eyes' striking resemblance to Tetsuya's, Tetsuya no.2 is the mascot of the Seirin High basketball team. He appears to be more intelligent than he looks, able to sense the atmosphere of team's players and bark at appropriate times. He took to pooping in Kagami's sneakers once, which angered Kagami at first. However, Kagami realised that those same sneakers had a gash in them that would have made it dangerous for him to play in. This display of Tetsu no.2's apparent intelligence convinced him to accept the dog as the cute team mascot. This odd but cute critter is a cheagle, sacred creatures who congregate in family groups within forests. Mieu was exiled from his tribe and ordered to accompany Luke fon Fabre and company on their journey for an entire year. The ring around him allows Mieu to communicate with human beings and control his fire breath. Although it's not covered by the anime, the ring also allows Mieu to fly and tackle objects as well as people when its full magical ability is restored. Mieu is, strictly speaking, Luke's servant for as long as his exile is in effect. He's an earnest creature and is always willing to do his best. Despite being treated horrendously by Luke at first, Mieu is undeterred and continues to refer to him as his master. Even if one hates his high, squeaky voice, there is no-one who can fault the dedication, loyalty, and concern he has for his comrades. 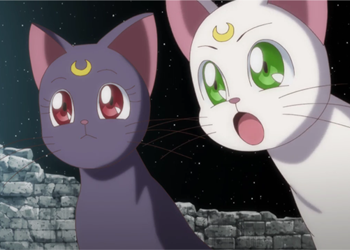 Luna and Artemis are guardian cats, advisors and protectors of the Sailor Guardians. They are able to communicate just as humans do and also possess at least the same level of intelligence. Although they are Sailor Moon's and Sailor Venus' companions respectively, they look after all the Guardians and help to guide the girls during times of trouble. The're not only cute, but excellent role models (and alarm clocks, in Luna's case)! This yellow cat-creature may be familiar to a lot of readers, even if they don't know his name. 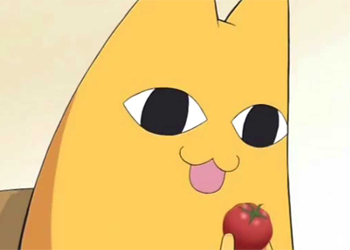 Known as 'Chiyo Chichi' or 'Chiyo's Dad', this creepy cat-thing claims to be, as his name suggests, Chiyo's father. 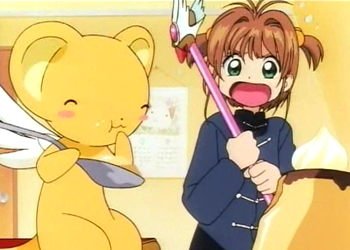 He appears only in the characters' dreams, although a soft toy version of him is given to Chiyo for her birthday despite the giver having no idea about the cat's existence. 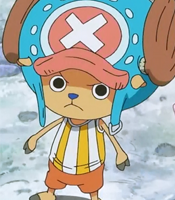 His expression hardly ever changes, even when he's angry, but he seems to care a lot about Chiyo. Kyuubey (or QB) is a mysterious, cat-like alien responsible for recruiting young girls to fight against demonic entities known as Witches. These Witches feed on the emotions and hopes of human beings and cannot be sensed or seen by normal people. 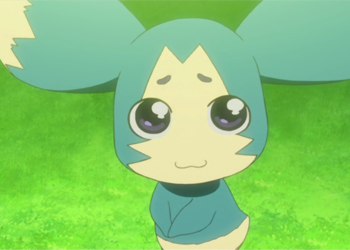 Kyuubey forms a contract with the girls he recruits, granting a single wish of theirs in exchange for their combat services. These girls become magical girls, each with a key power or weapon that allows them to fight Witches on relatively equal footing. Mostly a facilitator, Kyuubey appears before girls who have a desire that want to see fulfilled. It is an emotionless being incapable of understanding human rationale, only cause-and-effect lines of thinking. 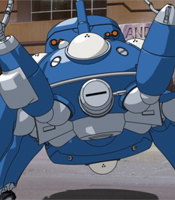 Due to its having its own ulterior motives, Kyuubey often withholds information it deems unnecessary for his contractors to know - unless they explicitly ask for it. 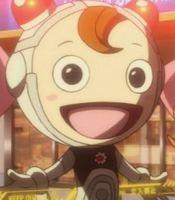 His cute smile and expressionless eyes have become recognized in the anime fandom as a symbol of pure evil. There are many more iconic figures of course. This article is by no means a definitive list. All of the anime above are worth watching, if you haven't already. 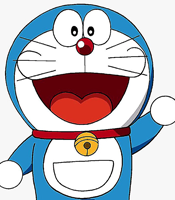 Mascots can be cute, witty, silent, expressive - they can even have a fleshed-out character of their own! There are eight others arranged at the top and bottom of this article, do you know them all?